This is one of the lessons we had on Wednesday night for our 3 year old class. We reviewed the Disciples and discussed Matthew, with the emphasis on Jesus loves everyone. I included the songs that we have been singing this quarter also. We begin the class with a prayer. Then, sing a couple of songs. So many lessons reinforce that Jesus loves them, so we sing Jesus loves Me and Jesus Loves the Little Children (we use these finger puppets). For this lesson we sang the Disciples Song also. I divided this lesson into parts so I could insert some hands on ideas. I began with showing them the Bible, they told me the two parts: Old and New Testament. The first book is Genesis and the very first thing we learn in Genesis 1:1 is: In the beginning, God created the heavens and the earth. They say it with me and we talk about God creating everything. 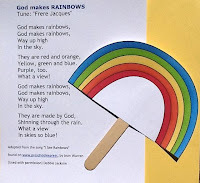 We also sang God Makes Rainbows and I ask them to tell me something God made from the colors on the rainbow. They love it and it helps them think about everything being from God. Our Bible lesson is in the book of Matthew (9:9-13) and Luke (5:27-32), the first book of the New Testament. The first four books are Matthew, Mark, Luke and John and they tell us about Jesus and His life on earth. They are called the Gospels. Jesus picked 12 men to follow Him. They were called Disciples. They stayed with Jesus and saw all the wonderful things He did. The Disciples saw all the people that Jesus healed. They heard all the new teachings that Jesus preached. Jesus taught all the different people. Jesus loves everyone! Remember, we talked about 4 who were fishermen. Peter and Andrew were brothers. James and John were brothers. Let’s talk about one of the men that Jesus picked to be a Disciple. 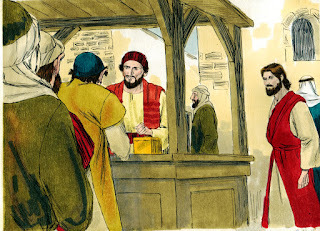 One day, Jesus met a man sitting at his tax booth. His name was Matthew. Tax collectors took money from the people and gave it to the Roman government. People didn’t like the tax collectors because they cheated the people and charged more for their taxes and kept the extra money. Jesus knew that most people didn’t like the tax collectors. But Jesus loved Matthew! Jesus loves everyone! Jesus went to the tax booth and told Matthew to “Follow Me.” What do you think Matthew did? 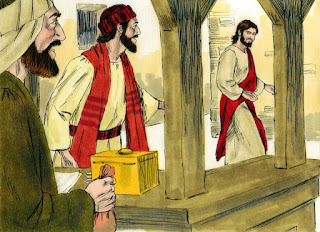 Matthew got right up and left his tax booth to follow Jesus. Matthew left right away to be with Jesus! Matthew invited Jesus and the other disciples to go home with him to eat a great feast. Matthew also invited some of his friends to his house. Some of the people that saw Jesus with Matthew and his friends couldn’t believe Jesus was with Matthew! 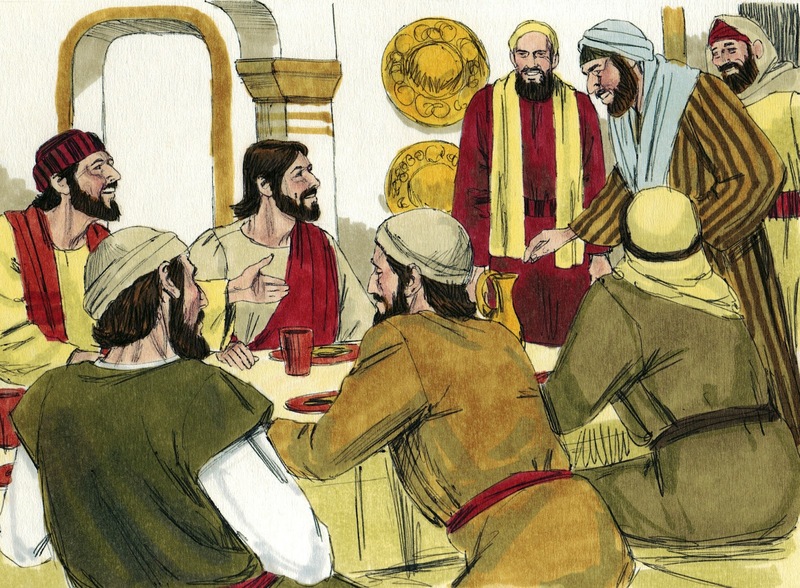 They asked the Disciples why Jesus eating with people like Matthew? He is a tax collector and a sinner! But, Jesus heard them and said that He came to help the sinners. Jesus loves everyone! We made this simple project because, well, I had made something different and didn't like it when I was getting everything together and needed something different quick! I used blue paper plates (to give the resemblance of the world). I printed these hearts for them to glue and they added these stickers. We talked more about Jesus loves them, even Matthew the Tax Collector that not too many people even liked. They added the smiley stickers because they are happy that Jesus loves them. We finished the lesson with this badge. I reviewed the Disciples of Jesus, asked about the fishermen, etc. We talked about Matthew leaving everything NOW to be a helper for Jesus. I asked the students to tell us something they can do to be a helper. Download the color and black & white badges here. Click here to print visuals. Click here to print pictures to color. Click here to see the Disciples of Jesus Flip Chart. Click here to see more for Disciples for preschool. Click here to see the full Disciples lesson & more. Hurray! I had difficulty posting a comment in Naboth and Elijah. This one is beautiful too. God's grace with the great work you're doing.